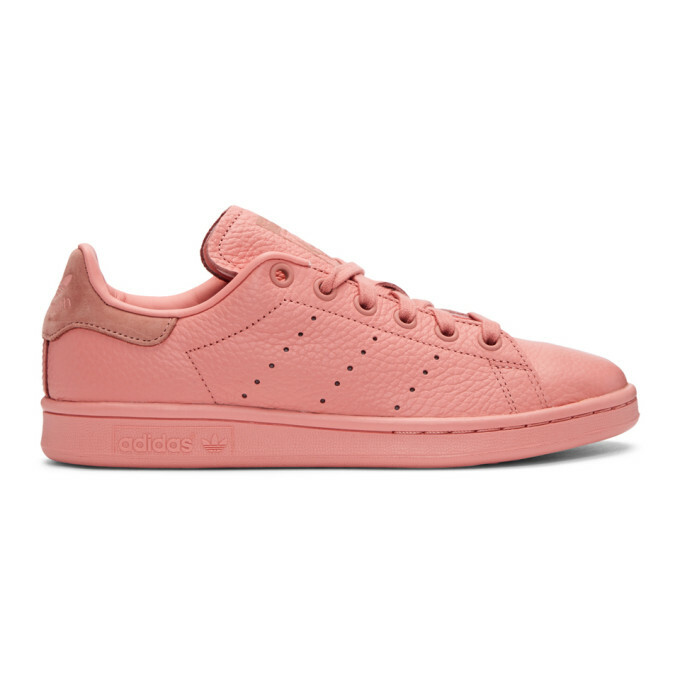 Low-top grained leather sneakers in 'tactile rose' pink. Round toe. Tonal lace-up closure. Logo stamp at tongue. Perforated stripes at sides. Logo bonded at nubuck leather heel tab. Rubber sole. Tonal stitching. 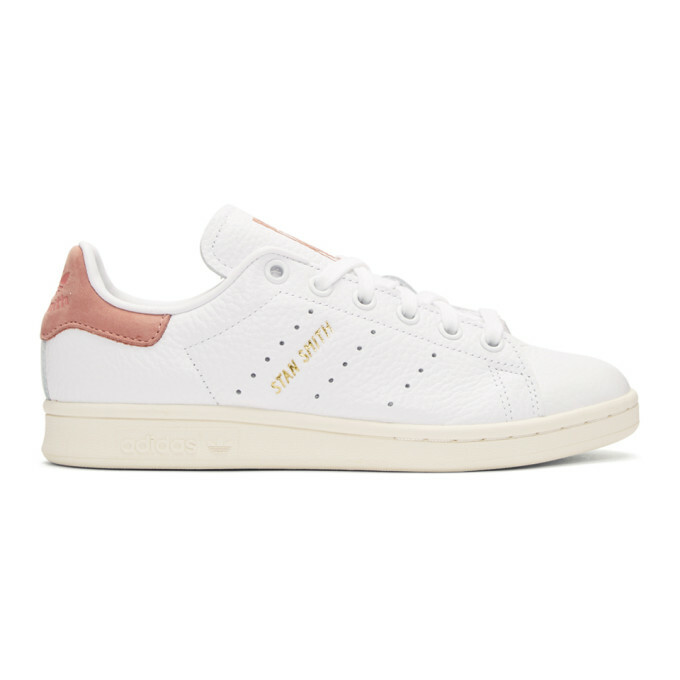 Low-top grained leather sneakers in white. Round toe. Tonal lace-up closure. Logo stamp in 'raw' pink at tongue. Perforated stripes at sides. Gold-tone logo stamp at outer side. Logo bonded at 'raw' pink nubuck leather heel tab. Rubber sole. Tonal stitching. Goatskin ballerina flats in black. Round toe. Strap featuring crystal-cut detailing at vamp. Tonal stacked leather sole. Silver-tone hardware. Tonal stitching. Patent leather ballerina flats in black. Pointed toe. Tonal grosgrain trim at collar. Adjustable pin-buckle strap at vamp. Covered heel. Leather sole in tan. Silver-tone hardware. Tonal stitching. 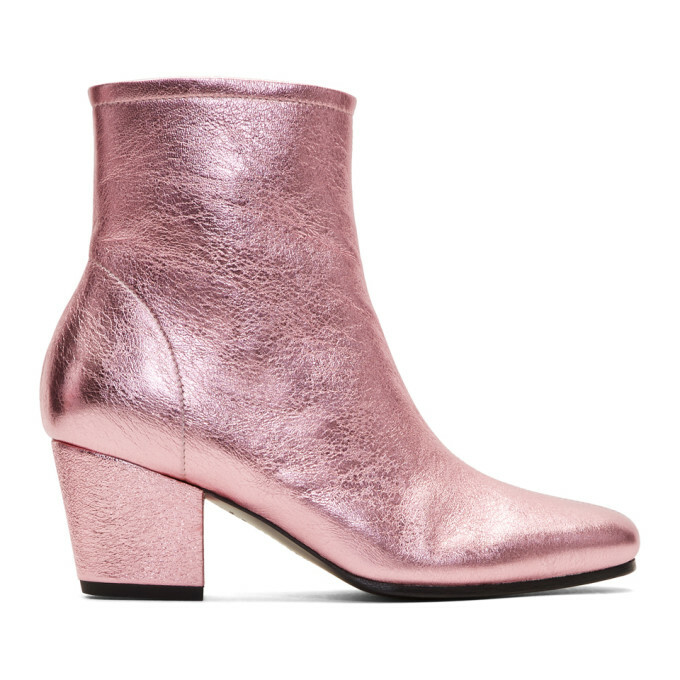 "Ankle-high metallic leather boots in pink. Almond toe. Zip closure at inner side. Covered block heel. Metallic leather lining in silver-tone. Leather sole in black. Silver-tone hardware. Tonal stitching. Approx. 2.25" heel." 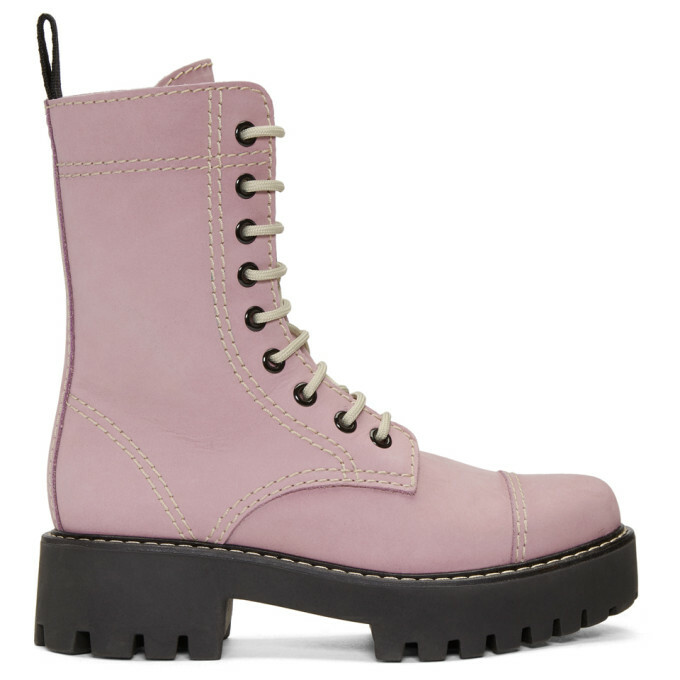 "Mid-calf nubuck leather boots in 'lilac' purple. Round toe. Lace-up closure in beige. Black grosgrain pull-loop at heel collar. Treaded rubber platform sole. Black hardware. Contrast stitching in beige. Approx. 1.75" platform." 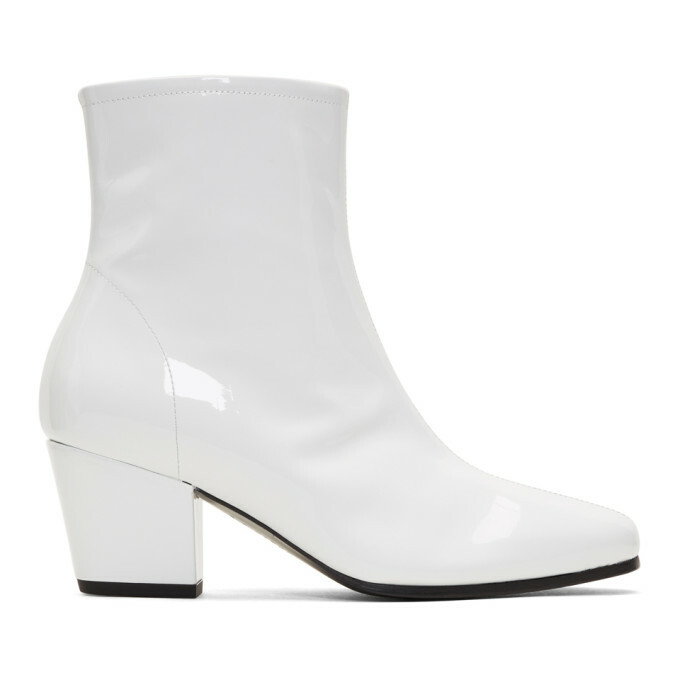 "Ankle-high patent leather boots in white. Almond toe. Zip closure at inner side. Covered block heel. 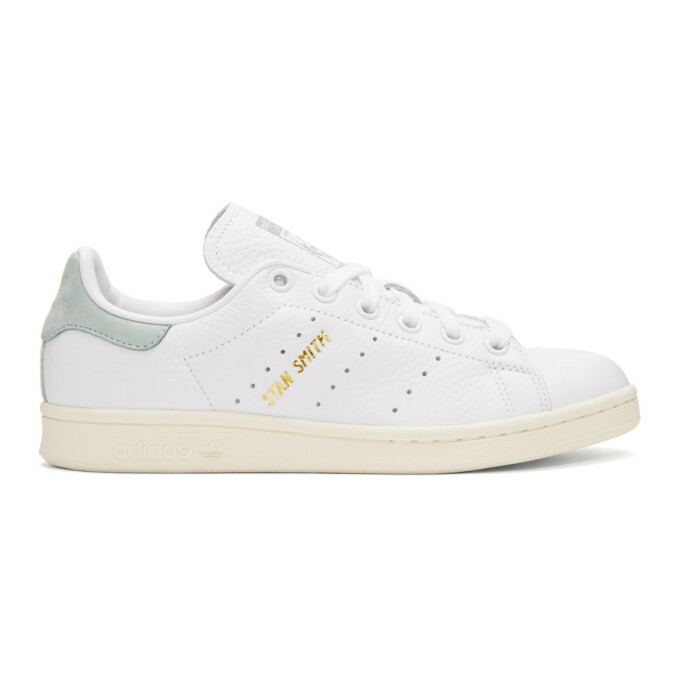 Metallic leather lining in silver-tone. Leather sole in black. Tonal hardware. Tonal stitching. Approx. 2.25" heel." 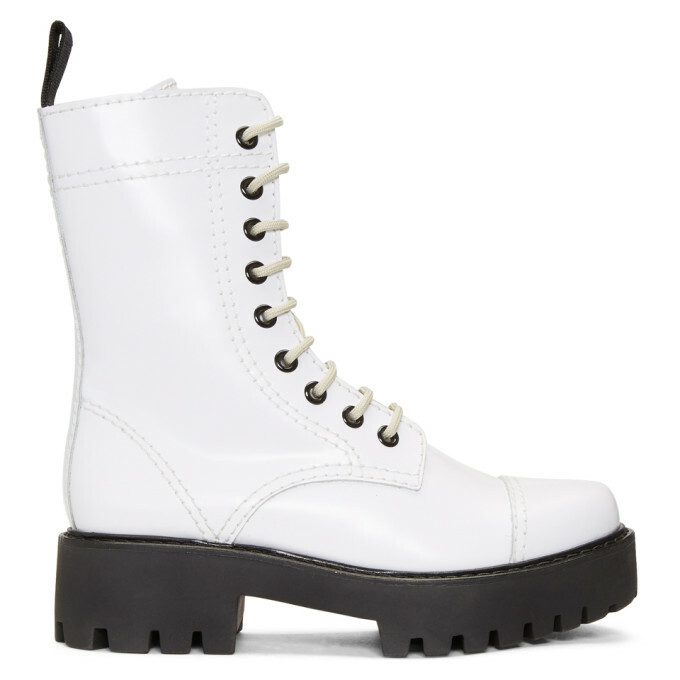 "Mid-calf polished leather boots in white. Round toe. Lace-up closure in beige. Black grosgrain pull-loop at heel collar. Treaded rubber platform sole. Black hardware. Contrast stitching in beige. Approx. 1.75" platform."